Football is a game of contrasting, yet complimentary circumstances, whether one looks at it from the perspective of an individual player, a team or an entire league system. Teams rise and fall, golden, trophy-laden eras make way for barren, trophy-less runs. Players come and go, and even in their active years, players attain varying levels of prominence before the sun sets in. These phenomena are, to some extent, natural and expected. No one realistically expects footballers to remain prominent at the highest level for endless years except for Ronaldo and Messi. However, when the transition from importance to inconsequentiality seems so fast like a flash of lightning, then it may stir up a few discourses here or there. This is the exact case of Victor Moses. It is no secret that Moses owes the glittering past of his Chelsea career to one man and one man only – Antonio Conte. 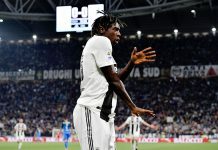 With a looming crisis in his maiden season following two consecutively vital defeats, the Italian embarked on a desperate search for a piece to fill in the blank right-wing-back space of his beloved 3-5-2 formation, a search which yielded a reborn Victor Moses. The Nigerian slotted into his new role seamlessly and executed his duties with the ease, expertise and efficiency of one who had played in the same role all his career. Plaudits flowed in from all corners as Conte’s Chelsea team, with Moses a key component, took teams apart week-in-week-out and deservedly claimed the league title that year. 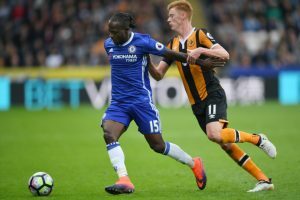 Failure to retain the league the following season did not diminish the importance of Victor Moses, as he was a regular feature even when the 3-5-2 as a system, gradually lost its fear-factor and potency. And then the sunset in… only this time, not at sunset. As it so happens naturally with the change of a manager, heads would roll, as the new gaffer tweaks the team to suit his footballing philosophy and vision. That Maurizio Sarri favours a traditional four at the back is enough to shut out Victor Moses, as this effectively eliminates the need for a wing-back (WB). In an era of overzealous and overlapping defenders, the right-back (RB) and left-back (LB) are licensed to burst forward where necessary to provide extra attacking outlets for the team. He also favours a short-passing game that relies on skilful players who are able to work tricks with the ball on their feet, take on and displace defenders to open up spaces. In reality, the RWB role that Moses so excelled in does not require an exceptional winger or defender, both of which, unfortunately, Moses was neither. It is a role that requires more of stamina to traverse the length of the wing as necessary and a good sense of timeliness and discretion to know when to join the attack or defence and when to pass the ball or move with it. The offensive impact of Moses was not so key, and perhaps, further diminished within those two years, for a traditional forward man, irrespective of a couple of goals he scored. Essentially, Chelsea’s wide men – Hazard, Pedro and Willian, and sometimes, Costa in Conte’s first season, not only knew what to do with the ball once it got to them but were also better doing it, compared to the Nigerian. This is largely the reason Moses has fallen behind all three in the pecking order since his ‘customized’ position was shut out by Sarri. 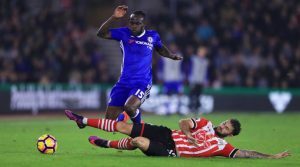 Victor Moses has been restricted to mid-week cup appearances to prove his mettle up front and no matter what anyone thinks, an exceptional performance in a Cup competition against a Championship side, for instance, may not be enough to convince Sarri of his ability to perform better than any of, say, Pedro or Willian in a key league match days later – Hazard’s position is not even debatable at this point. 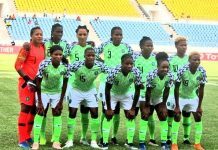 The transition from importance to inconsequentiality has indeed been quite steep and brutal for the Nigerian and his case was not helped by an underwhelming individual performance at the World Cup in Russia. Football itself can be so cold and brutal and at times like this, a revaluation of options becomes imperative. To be fair, Victor Moses has done more than enough, over the course of his career in the English top flight to earn a move to a top half side and command some level of presence. He, however, has to do more to rediscover his attacking instincts which were lost to the world for the two years he played under Conte. His continued stay at Chelsea under the present circumstances may not help his current and future cause. Not many would bet on those present circumstances getting any better within the foreseeable future.